Dodge reintroduced the Coronet name to its lineup in 1965 as a replacement to the company’s 330 and 440 models. The new Coronet, a nameplate absent since 1959, was a mid-sized line built on a 117-inch wheelbase, which was four inches shorter than Dodge’s full-size Polara. Styling was a simple slab-sided look, with a big greenhouse and a single beltline. The grille was flat with vertical bars and it had vertical taillights. Three separate series were available—the base Coronet, Coronet 440, and Coronet 500—with the main differences between trims being additional chrome trim and carpeting on the 440 and bucket seats and a center console on the sportier 500. A total of 209,393 Coronets were sold in 1965, which was comparable to Ford’s Fairlane, though significantly fewer than the Chevrolet Chevelle. Most importantly, however, sales totals significantly outpaced Dodge’s 1964 mid-size sales run. 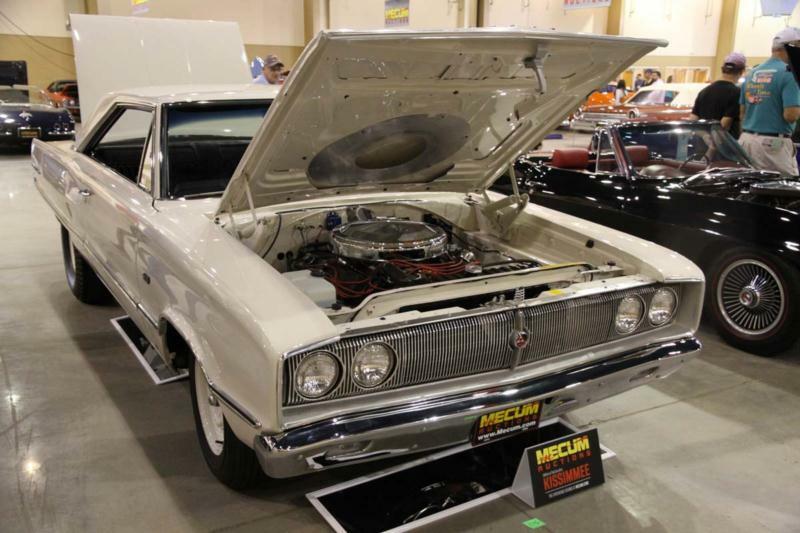 Body style and powertrain choices were extensive for the Coronet. A Dodge driver could order a two-door sedan, hardtop, or convertible; a four-door sedan; or a six- or nine-passenger station wagon. Locomotion could be supplied via a slant-six engine (145-hp, 225-c.i.) or a variety of V-8s (273, 318, 361, 383, 413 c.i. choices, or a ferocious 425-hp, 426 c.i. Hemi that was not warranted by the company nor was it officially offered to the public). Transmissions included three-speed column shift, three-speed Torqueflite automatic and floor-shift four-speed. The 1966 Dodge Coronet received a dramatic restyling that complemented Dodge’s new Charger fastback. The cars were shorter and wider, with sculpted sides and bold character lines at the top and bottom of the fenders. Mesh grilles with turn signals at the end were balanced by large square taillights. A Deluxe trim was added to the range as well. The engine line-up remained essentially unchanged with two major exceptions. The 440-c.i. Wedge V-8 replaced the 413-c.i. engine, and a 426-c.i. Street Hemi V-8, equipped with dual four-barrel carburetors and hydraulic lifters, could be ordered by consumers. The Hemi delivered 0-60 mph in 6.1 seconds and a quarter-mile run in 14.5 seconds. A reported 732 Hemi Coronets left the factory in 1966. For 1967, the Coronet adopted more Charger styling cues, including a new single-piece grille, but the car’s basic profile was unchanged. The 361-c.i. V-8 was dropped that year and a 440-c.i. Magnum V-8 was added. Most notably, Dodge debuted its R/T line on the Coronet, which stood for “Road and Track.” This sporty trim was available with either a 365- or 375-hp 440-c.i. V-8, or a Hemi engine, and included a heavy-duty transmission and unique air intake. In all, approximately 340 Hemi Coronets were ordered in 1967. Dodge radically redesigned the Coronet and Charger lines for 1968 into their respective “Bullitt” and “General Lee” configurations, and these later cars have largely overshadowed the 1965, 1966, and 1967 Coronets. Nonetheless, nearly 650,000 Coronets of this era were produced, and the model played a large role in establishing Dodge as a player in the emerging muscle car segment.